I'm always the last person to jump onto a trend of anything. Really. So I'm not surprised that I'm probably the last person to read The Hunger Games trilogy. I'm actually half listening and half reading it though. Yes, since becoming a more serious knitter I've resorted to listening to audiobooks. I just haven't mastered the art of knitting while reading. Not sure if this makes a difference in the whole effect of the books or not, but I really dug the audiobooks. I was listening whilst knitting or sewing, and reading when I wasn't. But because I'm so crazy in love with this trilogy I already plan on re-reading it again in the very near future - no audiobooks allowed. I'm definitely planning on reading the first book again before I watch the movie. Just to refresh my brain. I'm usually weary of movies adapted from books and find that the movie usually ruins the story, but I'll admit that I'm actually pretty freakin' excited about the movie when it comes out next month. Eeeek! 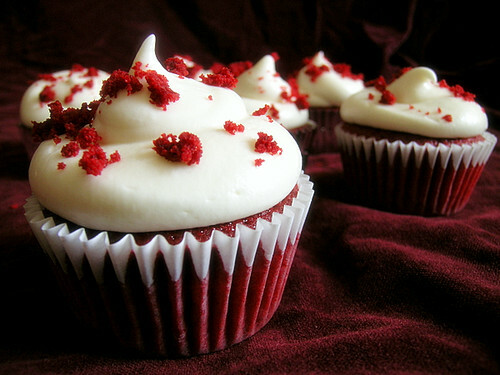 I absolutely LOVE red velvet cupcakes, cakes, whoopie pies, donuts, anything! I've been baking up batches of red velvet cupcakes all month long to try out all the different recipes that I've been spotting around the blogosphere. I haven't picked out a favourite recipe just yet, but I'm definitely enjoying the process of finding one! I'm not sure if it's because of its beautiful red colour and the fact that February is the month of love, but I always associate February with red velvet treats. Yum! 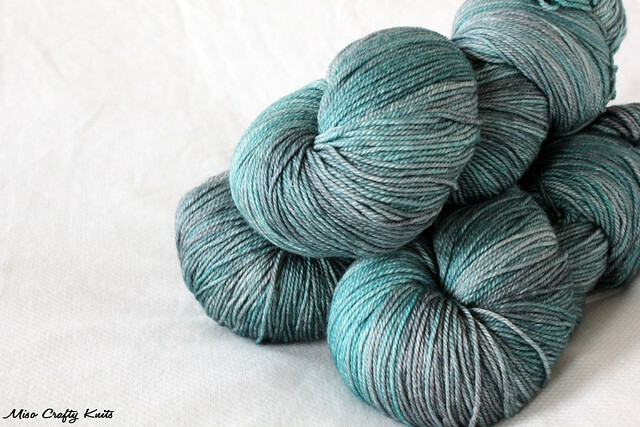 Even though I haven't knit a single stitch on any of my socks-in-progresses this month, I've been eyeing and drooling over self-striping yarns like you wouldn't believe. I still dream about owning a drawer full of striped knee-high socks and am planning on spending a good majority of the warmer months churning them out in preparation for next fall. I guess you could say I'm getting a little antsy about finally knitting and using up the lovely self-striping skeins that have been patiently waiting in my stash. I absolutely love Coal Hearted, Cinna-mon, and Heat of the Moment. I wouldn't normally wear it but I even love Fire in Flight. I think that colour would look awesome with some black tips. Kinda Halloween-ish maybe, but then again when doesn't that colour combo not get associated with either Halloween or tigers? Anyhoo, the names were changed to reflect the different districts of Panem. Can you guess which colour belongs to which district? Now to track down a place that sells China Glaze...before I go crazy! 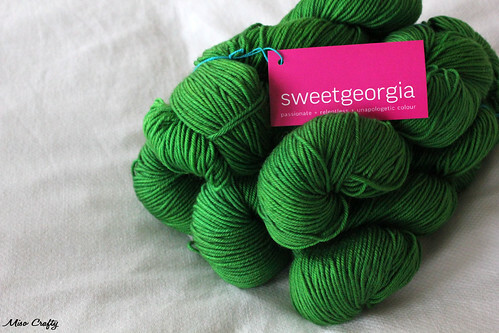 I'm still being drawn towards grey yarns but lately I noticed that green has been catching my eye too. Maybe because spring is just around the corner? Maybe I'm sick of the dreary and drab weather that we've been having? Either way, I think when I finally get a few WIPs off my needles that I'll be casting on with something green. Whether I was aware of it or not I've had the colour green slowly creep up and make small appearances: I've pulled out a few green skeins from the depths of the stash and placed them at the top of the pile, I painted my nails a beautiful mint green last night, I've been thinking of adding a lovely kelly green skirt to my wardrobe, and been bookmarking/favourite-ing/pinning sites that contain stunning green fibers. Yes, I think you'll be seeing some green pop up on this here blog in the next little while. How fitting that next month is March! Ok March, let's hope you don't fly by as fast as February did! ok first of all. i totally haven't finished the trilogy. so you are definitely not the last person to read it. ha. (but i'm trying to finish quick!) also. i looove green too! and i can't wait to see what skirt you'll knit up with that. seriously. i need to knit myself a skirt. I won't be knitting a skirt, but rather sewing. As much as I like the looks of some knitted skirts, I can't see myself actually wearing one. Immediately after I finished reading your post, I HAD to go buy a skein of that beautiful sweet fiber ever grey. So beautiful and it just had to come and live with me. And now I have to check out the Hunger Games. How did I not know about it? That green is gorgeous. Ooohh...what do you plan on making with your Ever Grey? It's so gorgeous, when I first saw it I had the same thought as you....it has to live with me! It's even more beautiful in person too! Hunger Games is more of a YA read, but unlike Twilight it doesn't insult your intelligence. I love the entire trilogy. I've put my mind at ease knowing that the characters are quite mature for their age and it's ok to love them so much! ;) Good luck with them (if you end up reading them!) and don't say I didn't warn you that they are addictive reads!! !